Everyone agrees — winter storms can be straight up nasty. Blizzards, chilling cold, roadblocks, huge snow accumulations, and power outages are all parts of winter we would all gladly forget. Severe winter storms can not only be an inconvenience, but a serious threat to your safety and to your home. It is important to be prepared for the worst winter storms, especially if you live in an area prone to them. Following these simple tips can help you and your family stay warm and, most importantly, safe during a biting winter storm. Don’t rely on your electricity to heat your home! A common part of winter storms are power outages and you do not want to be left out in the cold, literally, if your power goes out. Have a backup plan. A wood burning fireplace is a great alternative to help keep you and your family warm. Wood stoves are also a great alternative that can heat your living space. Make use of the sunshine! A great way to heat your home is by using the power of the sun. During the daytime, open your blinds up to let the light in. Doing so will heat your room and provide a nice glow to your home. Letting in sunshine is the easiest and oldest way to warm up your home. If the power does go out, your top priority should be eliminating unnecessary heat loss. This can be done by keeping all external doors closed as much as possible. Letting in that cold outside air can easily lower the temperature of your home by 5 degrees or more. Try to keep as many interior doors closed as well. This will keep the main room warmer. A good idea is to also cover up drafts under doors — especially the doors leading outside. Place a towel or draft blocker underneath to trap in heat. Layer up! Layering your clothing in the winter time is a good idea for any winter situation. 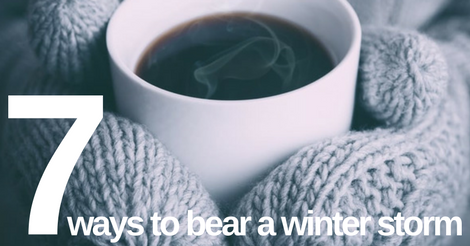 If your heating bill is starting to eat away at your soul, layer up while inside to save on heating costs. If your power goes out, layering up is absolutely crucial. Wool is a great insulator for layering. If you get itchy from wool, wear it as an in between layer, avoiding direct contact with the skin. Your car can be your best friend! Run your car’s heater and take refuge inside for brief periods. Bring along blankets and other materials to help keep you warm. Never run your car in a closed space. Always be sure there is proper ventilation. Layer up your bedding as well! Layering doesn’t apply only to your clothing! Adding a wool or down blanket to your bed can drastically increase the warmth of your bed. Add more blankets than you think you need and take them off if you get too warm. Electric blankets are also a great way to stay warm if your power is still working. Portable generators are a great resource to have around. Having a backup generator can eliminate many winter headaches, and give you peace of mind in a time of panic. Keep one out in the garage for those unpredictable times — you’ll be happy you did. The absolute best way to bear a winter storm is to be well-prepared for one on all levels. Take the time to educate yourself on winter storm safety, and take the necessary precautionary measures to ensure that you and your family are safe, happy and warm this winter season.